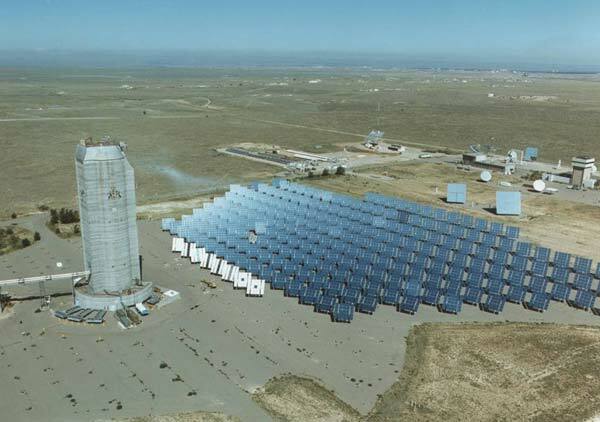 Opis: Even the largest of modern optical telescopes are small when compared with the light gathering power of the Central Receiver Test Facility (CRTF) located in New Mexico, USA. CRTF has 220 mirrors each over 7-meters in diameter all focused on a single tower. CRTF's main use is to investigate methods of collecting and using solar power. CRTF does not create focussed sky images like a normal astronomical telescope, but collects light from a much larger area. Recently, astronomers with the STACEE project have begun using CRTF to collect secondary light emitted when high-energy gamma rays strike the Earth's atmosphere. Photons in this range might allow further exploration of enigmatic gamma ray burst explosions, and might be emitted when cosmic rays from supernovae impact gas clouds in the interstellar medium.